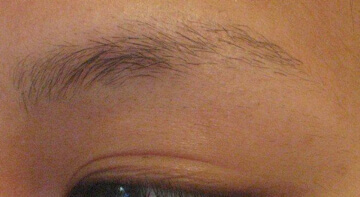 I have seen so many women who are convinced that their brows won't grow back and much to their amazement, their brows do grow back, if they just give them a chance. Ladies, please stop tweezing and waxing if you don't need it. Go to a professional for shaping. Fads come and go. A natural well shaped brow never goes out of style. As we age, our brows can make a big difference in our appearance. You can wear less makeup if your brows define your eyes, and your expression. They create balance for the whole face. How wonderful to wake up in the morning and not have to spend precious time penciling in your brow, and what about working out and swimming. 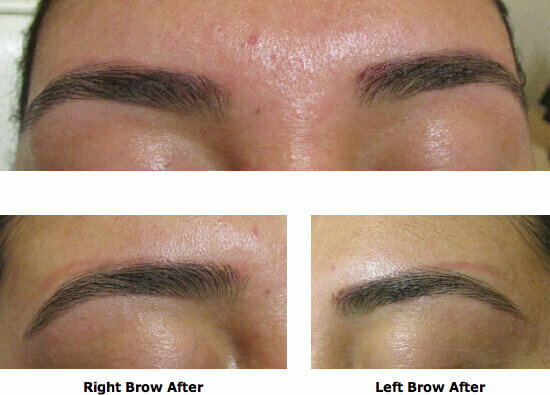 If your brow hair is light and thin, there are ways to compensate for that without tattooing. If you have "wild ones", there are remedies. As much as I love to give someone a beautiful tattooed brow..... if they need it, I especially love giving you back your freedom. Call me for a consultation. Client has plucked brows. She thought they would not grow back properly, and had them tattooed by another technician. The tattooing has faded. After approximately two months her brows have grown in completely. We shaped them periodically during that time to get her through the growing-in stages. As you can see she has her own full brow and never needed tattooing in the first place! She can add shading for a more dramatic look. Could this be you?? 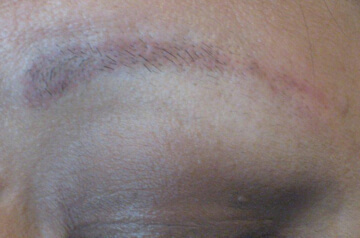 Once again, client has become a little tweezer happy and didn't think her brows would grow in. I asked her to let them grow in, which took a couple of months. 2-3 months later, as you can see, her brows are filling in. They are not perfect yet, but there is a great deal of progress. She may need brow shaping from time to time. Brows tweezed and waxed too much. Brows almost completely grown in. 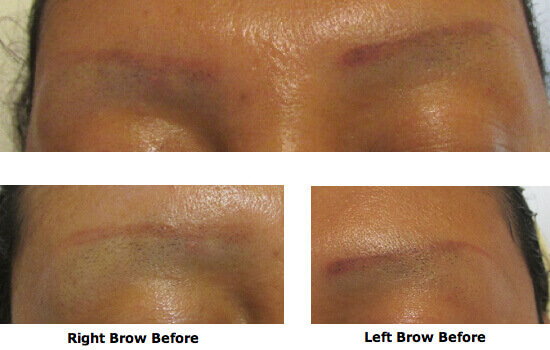 Permanent makeup was not necessary. Brows have faded. Look closely and you will see dark hair starting to grow. Also see picture below. Brows have almost grown in. I shaped them for her during the growing in period. Her own brow hair almost completely covers the old tattoo. She never needed tattooing in the first place. Brows completely over-tweezed. "N" had her brows tattooed and now wanted her own brows back again. "N" contacted me through the Internet from my website to see how she could go about re-growing her brows and how to shape them. I marked the hairs to take, sent back the pictures to her, and we did this a few times all via the Internet. I just wanted to email you and say how much I appreciate your section called when to not tattoo eyebrows. 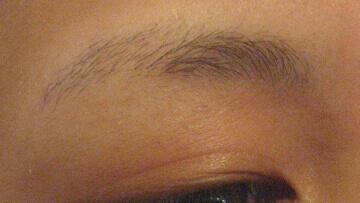 Most techs don't advertise to let your brows just grow. They will push you to get the tattoo done. My father naturally gave me thick brows and I overtweezed so i went to get them tattooed and the tech destroyed them. It took two years to remove and regrow my eyebrows. I recently overtweezed so I'm letting them go for a full six months using a special serum that I love. It accelerates the growth process. Seeing your section on when not to tattoo inspired me not to get it done again and just wait till they grow so I can shape them and fill them with powder. Thank you again for your inspiration.